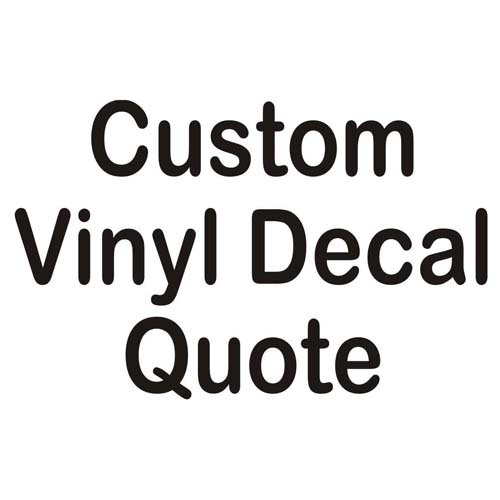 We are always happy to provide you with a quote for customized vinyl graphics, decals, wall art, vehicle lettering, etc. Nearly any font, phrase, or graphic can be precision cut and shipped to you in a timely manner! To receive a free quotation, simply describe, in as much detail as possible, the project you are working on. You can input this information in the text field above. Please include details such as vinyl color(s) to be used, size of the decal, number of decals required, and the date you will need to take delivery. Once you have provided as much information as possible, please proceed through the checkout process in the usual way. You will be asked for your contact information but you will not be charged for this quote request. Once we receive your request, we will contact you right away to provide you with a quotation! Thank you for allowing us the opportunity to work with you on your custom decal project! See just how easy it is to install vinyl decals!